He was born in 1960 in Trino-Vercelli, in Italy. He studied Political Science at the University of Milan, where he also followed Business Administration and Marketing seminars. He worked for eight years in Italy (1983-1991), first for RAS, Riunione Adriatica di Sicurta’ (ALLIANZ) and then for PADANA Assicurazioni, the captive company of E.N.I, the Italian Petrochemical Conglomerate. In 1992 he came to Greece and worked for Willis Corroon as assistant of the General Manager and for Euromerchant Insurance Services SA (Eurobank Group) in the Customer Corporate department. In 1997 he joined the “N. Canellopoulos & Ch. Adamantiadis” Insurance Group (legal representative of AIG in Greece), first as Manager for Engineering & Financial Lines Profit Centres and later as Director of Commercial Lines. 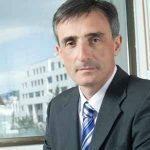 In 2008, he was appointed Chief Operating Officer for AIG Greece S.A. and since May 2010 he is the Country Manager for AIG Greece S.A. He is a member of the Board of Directors of the Hellenic Association of Insurance Companies and President of the Liability Committee.